This element contains the Entity ID of the Entity to which this Input Pin is connected. This optional element contains the Output Pin Number of the Output Pin of the Entity to which this Input Pin is connected. The default value is 1. Only used when the Input Pin is connected to a multi-output Entity. There is no further information on the internal signal paths inside the Output Terminal. 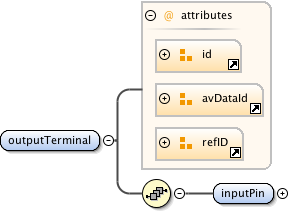 The Output Terminal accepts the entire AVCluster that enters its Input Pin and uses the information to finally produce the content as described by the corresponding AVData Entity.